What is one of the most important elements to effectively managing an affiliate program? The answer is simple, recruiting new (quality) affiliates. One of the most common themes when speaking to merchants that have under-performing affiliate programs (even ones that have successful ones mention it) is that they cannot find affiliates to promote their products or services. It may be a lack of knowledge on where to find them or they are not willing to put the work in, but either way, locating and successfully recruiting affiliates is a necessary element to any successful affiliate program. Creating paid search campaigns on Google, Yahoo, and Bing are effective ways to get an affiliate program in front of affiliates. Keywords such as “affiliate program” and those of direct (and in-direct competitors) are good ones to bid on. Even keywords related to a specific industry can be effective. Placing ads for an affiliate program in popular magazines is a relatively low cost and effective way to get in front of targeted, quality affiliates. FeedFront caters to both affiliates and affiliate managers. This is a less frequently used technique but can be effective if done properly. This technique can be used in two ways; first, it can motivate current affiliates and secondly, it can provide great new affiliate partners. Second-tier affiliates are referrals from current affiliates. Typically, current affiliates are rewarded with a bounty (ex. $5 per referral), but also can be paid ongoing commissions from their referrals. The decision is up to the merchant. 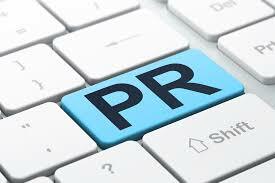 Press releases can provide effective recruitment opportunities for many years in the future. Merchants can use press releases to announce the launch of their new affiliate program, milestones reached, partnerships created, but the beauty of it is the SEO value. If properly optimized with relevant keywords they can be successful recruiting tools. Passively recruiting does not mean to stop actively recruiting, what it means is to use both methods in tandem and maximize the effort to grow an affiliate program to new levels. Many merchants ignore the passive recruiting methods, but successful affiliate programs interweave them into their overall strategy. Managing an affiliate program requires careful attention to details. Effective program management is not only about recruiting, activating, and compliance policing, but also little details that keep the program operating and functional at all times. Having all affiliate communication documents uploaded, an email address where affiliates can contact the program manager anytime, but for ShareASale merchants maybe the most important detail is enabling the auto-deposit function in the ShareASale interface. ShareASale gives merchants the option to auto-deposit funds into their account when the balance hit a certain threshold. It is recommended that all merchants set up this feature before launching. Having an account balance go negative will result in all affiliate links being turned off (until the account balance is positive) and you can guess what that means; unhappy affiliates. In this post, I will explain step-by-step how to set it up to ensure your program never goes offline due to a low or negative account balance. After logging in to the ShareASale merchant interface go to “My Account” and then “Deposit Center”. This step a merchant can either make a deposit with a credit card or set-up the auto deposit feature. Merchants can make a deposit at any time even if the auto-deposit feature is enabled. For example, if they anticipate increased traffic and sales during a given period the deposit can be done at this step. 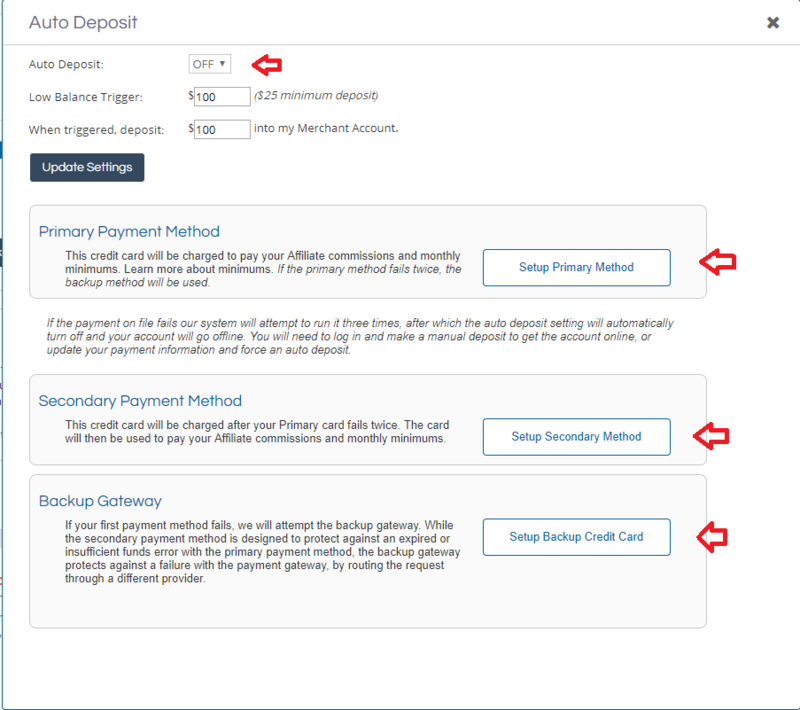 To set up the auto-deposit feature click the “Update Auto-Deposit Settings” button. Merchants should have two methods (if possible setup the backup gateway) in case one does not work. Input credit card # 1 in the primary payment method and credit card # 2 in the secondary payment method. The next step is to turn the auto deposit on and set up the low balance trigger and how much to deposit once the low balance trigger has been enabled. It is recommended to not let a merchant account dip below $100, but the more in the account the better. Once all sections are complete, hit “Update Settings”. Now the auto deposit setting is enabled. Merchants can now see their current settings and the last four digits of the primary payment method. All of the settings can be adjusted at any time. Simply follow the same steps. Attention to details in managing affiliate programs is vital. Making sure the affiliate account is fully funded and has backup options is also critical to the success of a program. 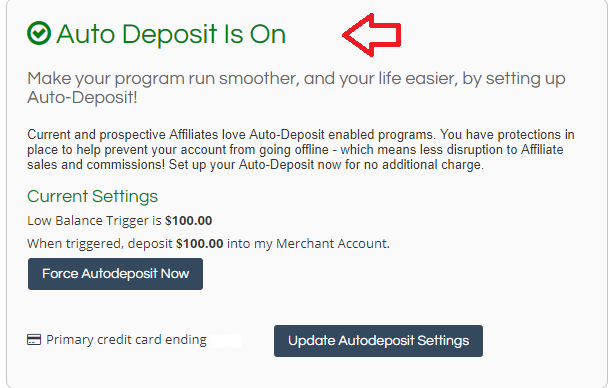 If an affiliate sees the auto deposit feature is off they may be hesitant to apply to join. Sometimes it is the little things that matter the most.